Sawback Survival Machete w/ Compass & Sheath 20 in. This beast of a machete packs a 13.75 in. stainless steel blade with heavy sawback serrations for supreme sawing applications. The blade has a heat-treated black finish for a non-reflective appearance. A metal hand guard protects your hand from slipping to the blade, and the non-slip handle provides a firm grip. The end cap houses a survival compass as well. A leather blade sheath is included. 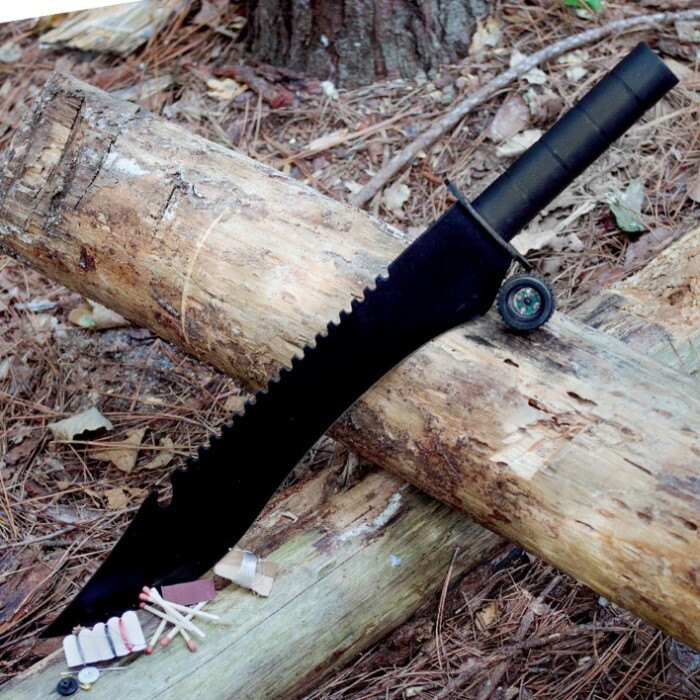 A surprisingly nice survival machete. Decent quality with an exceptionally nice sheath. Well worth the cost. If you want to spend a hundred+ dollars for a better knife, then by all means do it. But for the price it's a decent disposable chopper. I bought this thinking it was a good deal. The blade is attached by a single bolt and nut to the hilt. I took it out of its nylon sheath and it came loose. After a little wiggling the nut came off the bolt and now I have a worthless piece of sharpened metal that I can't even attach to anything. Not worth any price. Bought this just to try it out. Cut and chopped pretty well... then the handle broke off, and now I have a worthless piece of sharp-ish metal laying around my house... Make it worse they took down my review the first time I posted it. Gave this knife as a gift to my American Legion buddies. My intent was to please them and they loved it as is both beautiful and macho. I bought this machete and it was nice for the first couple of weeks, however when i actually started using it the blade lost its strength, it would move sideways until eventually it fell off, and this was only after cutting a small branch of a tree whil i tried to clear a tennis court. 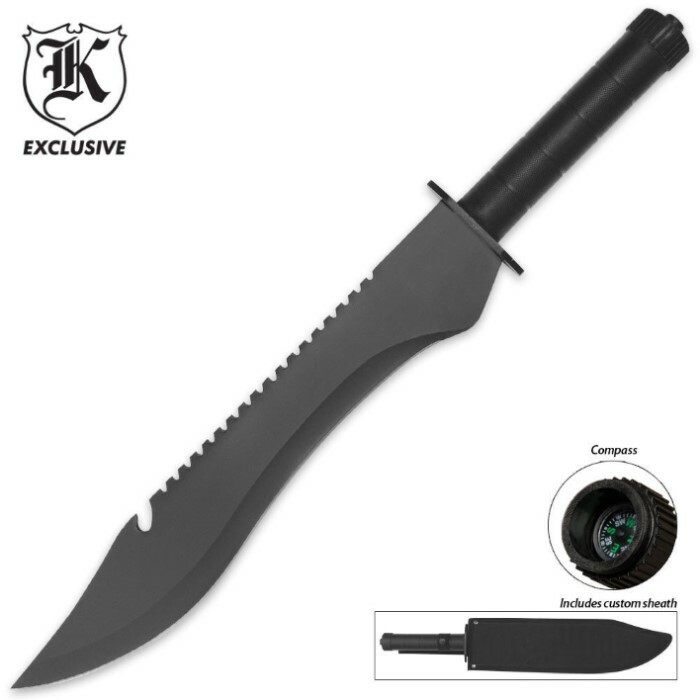 i would not recommend this for anyone no matter how cheap it is or how nice it looks, it would be better to invest on a nice bowie knife, the last longer, look better, and can do much more than this machete. Nice blade, really. I would thought a blade this robust would be full tang. I'm disappointed the handle is bolted on considering the amount of vibration it should be able to endure being a machete. I'm probably going to weld steel on in it's place. Right now it's good for hacking up brush and briar for concealment and other light duty tasks. It's a decent piece, especially for the price. Black is beautiful and this black is more! cut or saw makes no difference with this baby. oops!MONSTER...Its long blade and sawback is long and heavy. "A huge Knife,or machete is proper-DOUBLE UTILITY. Make no mistake. This is a mans blade. I also like the sheath for it. I have bought six of them with no complaints.I give it five stars because of the price and the utily of the blade.A extremely good value.JERRY HINES AKA THE KNIFE MAN. this machete is a monster very sturdy and sharp well balanced just a great machete over all .